Gala Bingo | Get £40 Bonus when you join NOW! * Gala Bingo Terms: 18+. New online customers only. Min first deposit and spend £10 within 30 days on bingo tickets only. 4x wagering reqs (bonus + winnings) apply. Bonus not withdrawable. Bonus valid for 7 days (bonus + winnings removed). £10 stake on selected games for The Chase Daily Quiz Game. Once per day. Max prize pool £1k. T&Cs apply. Gala Bingo has established itself as one of the top online bingo sites around! 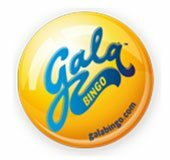 Gala Bingo has an incredible reputation, massive online presence and great promotions. The brand is a part of Gala Coral Group, which is one of the largest operators of live brick-and-mortar bingo halls in the UK and boasts over 5 million members and 175 clubs across the country. When you join Gala Bingo you'll receive one of top new player bonuses available. Spend £10 on bingo and you'll be able to play with a whopping £50 right from the start. The hottest promos on offer include the £6 million Summer Bingo giveaway and Team Bingo to share the prize winnings. You can also find offers like Stairway to Heaven Bonuses, Superstar Jackpot and Majestic Monday Bogof. There many more amazing promos at Gala Bingo, so you've got to check them out for yourself. Also be on the look out for Lord Bingo's favourite Gala promo, Penny Bingo, which lets you can turn coppers into cash! Gala Bingo plays host to an impressive variety of games. There's are 22 bingo rooms available with a range of 75-ball, 80-ball and 90-ball games. You can also play the brand new, quick-fire 50 ball game, Coconut Island with a £1,000 jackpot up for grabs. The brand also offers a Gala Live feature, which features live bingo hosts broadcasting over a live feed. This awesome feature brings the bingo hall action directly to your living room. When you head to the casino lounge, there are a wide variety of table games offer. This includes a staggering number of slot varieties, Blackjack, Roulette, scratch cards and Lotto games. In fact, players have access to more than 300 games on the desktop version of the site. Some of the top instant games available include Amazon Queen, Montezuma, Clover Rollover, Spartacus, Crystal Forest and of course the ever-popular Fluffy Favourites. Gala Bingo’s mobile app can be downloaded directly from the iTunes store. You can enjoy all of your favourite bingo rooms and games straight from your mobile device. There are an unbelievable 13 bingo rooms to choose from featuring daily jackpots and 24/7 ticket pre-buys. The app operates seamlessly on iPhone, iPad and other Tablets and Smartphones like Android, Samsung and HTC devices. With over 60 different games to choose from and 13 different bingo rooms, there is no shortage of options for gaming on the go. Some of the bingo rooms include Gala classics like Interstate 75, 1980 Club, Metropolis, Lucky Numbers Bingo and Deal or No Deal. In addition,, Gala’s mobile app lets you choose from an incredible variety of slots and other games. Some of the top titles available on the Gala Mobile app are Britain’s Got Talent Superstar, Zodiac Supernova. You can also find Snow Queen’s Magic and Pirate Plunder. Gala Bingo's customer service is one of the top in the industry, and this is to be expected of a high-end bingo site. The customer service representatives are available 24 hours a day 7 days a week and are incredibly friendly and helpful. They are available via phone or by Live Chat directly on the Gala Bingo site. Check out this video of the latest Gala Emmerdale Commercial!